The Billboard.net Weather Portlet displays continuously updated weather data and forecasts for selected cities. You can customize the data and the display yourself, or allow end users to set their own defaults and preferences. 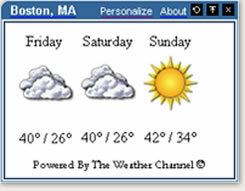 Currently the Billboard.net Weather Portlet is provided free. The Billboard.net Weather Portlet is based on JSR-168 Portlet API so the installs is easy. The Weather Portlet requires Oracle 10gAS Portal Release 10.4. Want to see how the Billboard.net Weather Portlet would look on your own intranet portal? Create a WSRP Provider with a connection URL to http://www.boardaxis.net/Billboard_Free_Portlets/portlets?WSDL and enjoy.